Curated by Marina Abramovic and artists Paula Garcia and Lynsey Peisinger, Terra Comunal – MAI was the Institute’s most ambitious undertaking to date. At SESC Pompeia, MAI presented the Abramovic Method; a series of talks with Abramovic; and eight Brazilian artists who performed during the duration of the exhibition. There was also a designated space for free experimentation and collaboration where visitors had the opportunity to explore the directions and limits of immaterial art and performance, as well as special programming that includes re-performances of Abramovic’s work by artist Andrea Boller. I was invited by communication agency Flagcx to design the posts for MAI official channels. 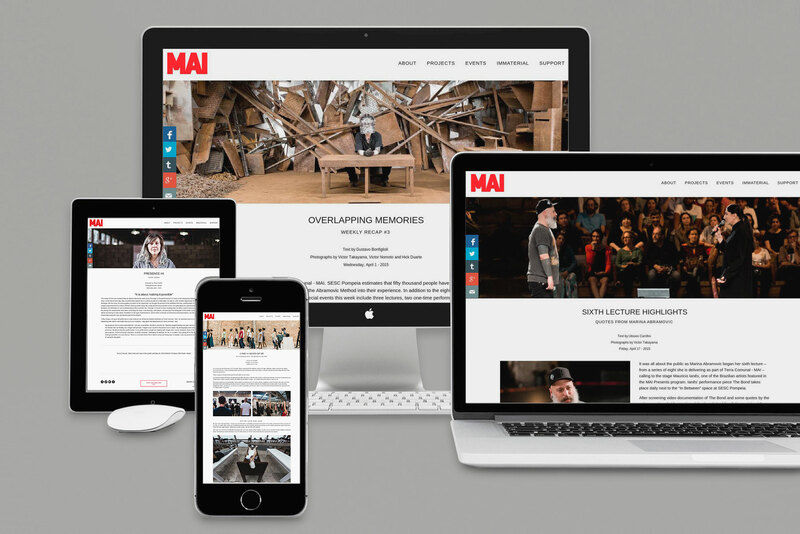 During two intense months, a team made of photographers, journalists and designers covered the exhibition on a daily basis that resulted in over 50 posts on MAI’s website.